Then, as I waited for the husband to finish up his more substantial meal, I started to feel sick and dizzy. And confused. Then hot and clammy. I told the husband that I felt worse, and put my head down on the table. I told him I wanted to step outside and get some fresh air. Then, as we headed out… well the next thing I knew I was waking up on the floor having fainted. Luckily the husband had caught me and put me down. I felt immediately a lot better, and continued to get a lot better – although my lips were a worrying blue for a while. The husband phoned NHS24 for advice, and having established that I was not choking and had not had a seizure they didn’t seem too bothered. They said they’d phone back to tell us what to do ‘within three hours’. As we were headed further away from civilisation and phone signal the husband decided to ignore them and take me to a hospital to be checked. Following some unfruitful web searching we found a hospital about 20 minutes drive back, and so we headed there. They had an out-of-hours GP service and very helpfully checked me in, and I was seen about ten minutes later. The out-of-hours GP was extremely kind and thorough, and seemed to think it right that a pregnant woman that fainted for no reason should be checked over. He took my medical history and details of the IVF and what medication I was on. He tested my blood pressure sitting and standing, felt my tummy, and took a urine sample. 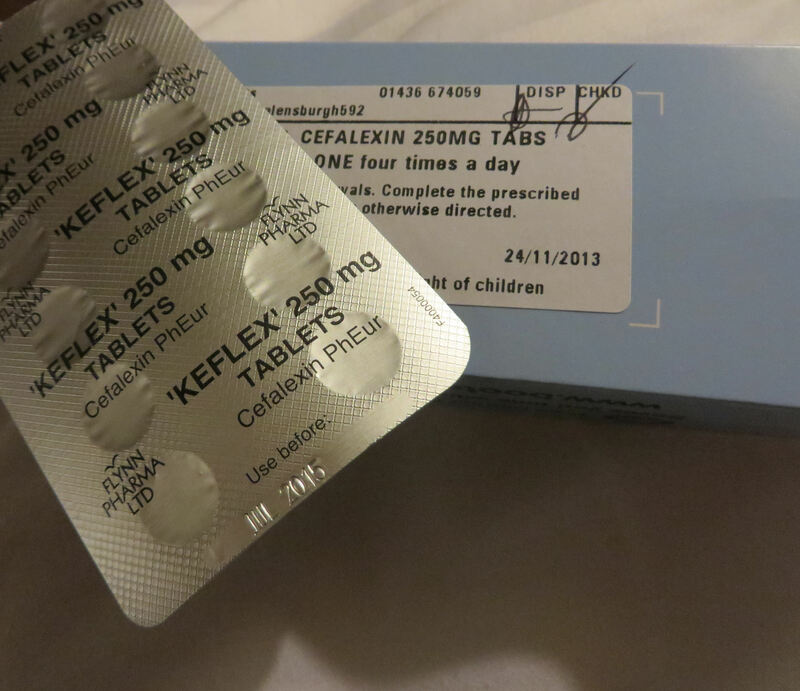 All appeared to be normal apart from the urine sample which indicated I might have a UTI, so he prescribed me a course of antibiotics (Cefalexin) that are suitable during pregnancy. I have my reasons for thinking it might not be a UTI (which I won’t go into but relate to tests I had ten years back) plus I don’t feel like I have a UTI (and I’ve had loads before) but I thought probably no harm in having some antibiotics. So. Picked up the prescription and took one of the tablets and we set off on our way. I’m now feeling extremely sorry for myself. Still a bit sick, still veeeeery tired, still can’t do much more than sit about, still find the thought of food turns my stomach… and now I’m scared to eat or be anywhere unsupervised in case I pass out again. I feel very anxious and unwell. It is horrible, really horrible. I feel crappy and pathetic. oh no, I hope you feel better soon. I can’t believe the helpline was so…unhelpful. Maybe you should go back to the doctor if you still feel bad.